Annual Australian growth slowed to 1.7% in the March quarter hit by bad weather & weak consumer spending. A declining drag from falling mining investment, strong public infrastructure spending and a likely resumption of trade contributing to growth should all help keep Australia out of recession. However, soft consumer spending and a slowing in the housing cycle will act to constrain growth to below Reserve Bank of Australia (RBA) and Government forecasts. As such, there is far more chance of another RBA rate cut than a hike over the next year. Australian shares will likely be higher by year end. But global shares are likely to continue outperforming. Despite numerous forecasts for an “unavoidable” recession following the end of the mining boom early this decade, the Australian economy has continued to defy the doomsters and keep growing. However, recently it seems to have hit a bit of a rough patch. After contracting in the September quarter, the economy bounced back in the December quarter only to falter again in the March quarter. While there was relief that we didn’t see another contraction, as had been feared, and the economy has now had 103 quarters without a recession, it would be wrong to get too excited. 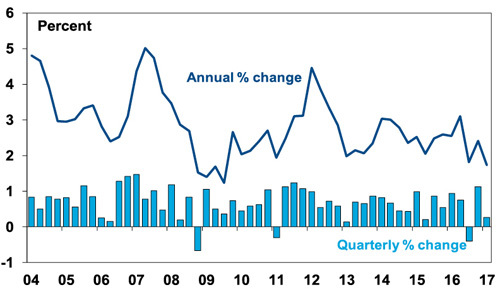 March quarter growth was just 0.3% quarter on quarter and annual growth slowed to 1.7% year on year, its slowest since the global financial crisis (GFC). Consumer spending is heavily constrained by record low wages growth and high levels of underemployment resulting in real household disposable income growth of just 0.4% over the last 12 months. While real consumer spending grew more strongly than income at 2.3% over the last year, this was only possible because of a fall in the household savings rate to 4.7% from 6.9% a year ago. Rapid increases in the cost of electricity, talk of an increase in the Medicare levy and high debt levels are probably also not helping. All of which is showing up in relatively low levels of consumer confidence. The housing cycle is starting to slow. Falling building approvals point to a downtrend in housing construction activity (see next chart). Similarly, the wealth effects from home price gains are likely to slow if, as we expect, Sydney and Melbourne property price growth has now peaked under the weight of bank rate hikes, tighter lending standards, rising supply and poor affordability. 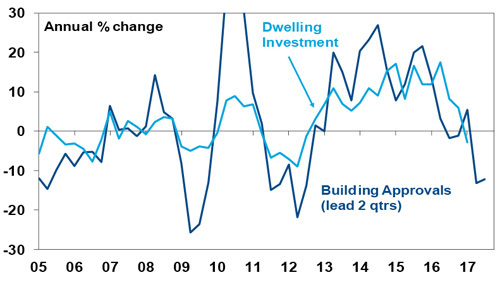 The impact of the housing cycle on the Australian economy is regularly exaggerated. Last year it contributed around 0.3% directly to GDP growth (via housing construction) and indirect effects look unlikely to have been more than another 0.3%. In other words, not a huge amount. But nevertheless it will be a drag on growth when it slows. 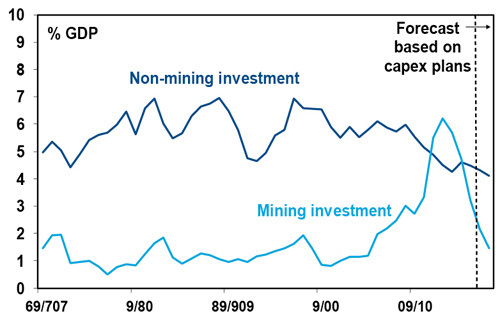 The big drag on growth from falling mining investment is nearly over. Mining investment peaked at nearly 7% of GDP four years ago and has been falling at around 30% per annum, knocking around 1.5% pa from GDP growth (and a lot more in Western Australia). While it’s still falling rapidly, at around 2% of GDP now, its weight in the economy has collapsed reducing its drag on growth to around 0.5% for the year ahead and it’s getting close to the bottom. Secondly, public infrastructure investment is rising strongly, up 9.5% over the last year, in response to state infrastructure spending much of which is financed from the privatisation of existing public assets. 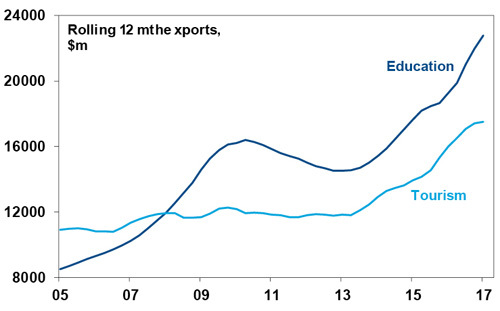 Finally, net exports or trade is likely to return to contributing to growth as the impact of Cyclone Debbie fades, resource projects including for gas complete and services exports continue to strengthen. These considerations should ensure that the Australian economy continues to grow and avoids recession. However, the drag from soft consumer spending and an end to the east coast housing boom will likely leave growth stuck around 2 to 2.5%. This is below Government and RBA expectations for a return to 3%, posing downside risks to the inflation outlook. In an ideal world and given the declining potency of monetary policy (and the fear of reigniting home prices gains), this would be the time to consider income tax cuts (or “cheques in the mail”) to help shore up consumer spending. The Government could consider financing this by dropping/delaying the cuts to corporate tax for large companies that are stalled in the Senate. However, since the corporate tax cuts were due to kick in much later, the budget deficit would still blow out in the short term and it’s doubtful the Government would want to allow this given the risk of a ratings downgrade. As a result, the pressure to do something if growth remains sub-par and underlying inflation stays below target will fall back to the RBA. As such our view is that the chance of an interest rate hike in the next 12 months is very low and the probability of another rate cut has pushed up to around 40-50% (well above the probability implied by the money market of 11%). Yes, the RBA remains reluctant to cut rates again and showed no signs of an easing bias in its June post-meeting statement, but then again it’s been a reluctant rate cutter all the way down since 2011. Key things to watch for another rate cut are: a softening in jobs data; continued weak consumer spending; another downwards revision in RBA growth and inflation forecasts; significant cooling in the Sydney and Melbourne property markets; and the Australian dollar remaining relatively resilient. There are two major implications for Australian based investors. First, continue to favour global over Australian shares. While US and global share indices are hitting new record highs, Australian shares remain well below their pre-GFC peak. 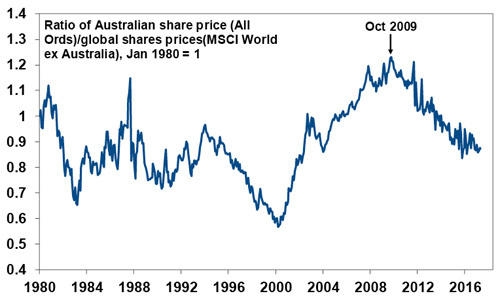 In fact, Australian shares have been underperforming global shares since October 2009. See the next chart. This reflects relatively tighter monetary policy in Australia (the US had money printing and zero rates and Australia had neither), the commodity slump, the lagged impact of the rise in the $A above parity in 2010 and a mean reversion of the 2000 to 2009 outperformance by Australian shares. While the underperformance has reversed half of the 2000 to 2009 outperformance, it looks like it has further to go reflecting weaker growth prospects in Australia. We see the ASX 200 higher by year end, but global shares are likely to do better. Secondly, maintain a decent exposure to foreign currency. A simple way to do this is to leave a proportion of global shares unhedged. 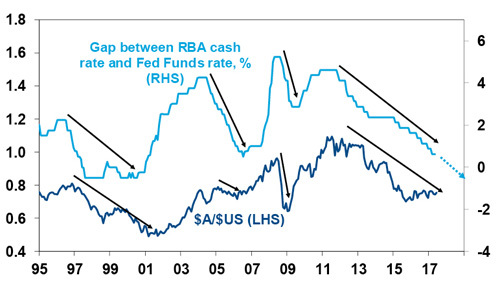 Historically the $A has tended to fall against the $US when the level of interest rates in Australia relative to the US is falling. See the next chart. With the Fed likely to continue (gradually) raising rates and the RBA on hold or potentially cutting rates again, the risk for the $A remains down. Important note: While every care has been taken in the preparation of this document, AMP Capital Investors Limited (ABN 59 001 777 591, AFSL 232497) and AMP Capital Funds Management Limited (ABN 15 159 557 721, AFSL 426455) make no representations or warranties as to the accuracy or completeness of any statement in it including, without limitation, any forecasts. Past performance is not a reliable indicator of future performance. This document has been prepared for the purpose of providing general information, without taking account of any particular investor’s objectives, financial situation or needs. An investor should, before making any investment decisions, consider the appropriateness of the information in this document, and seek professional advice, having regard to the investor’s objectives, financial situation and needs. This document is solely for the use of the party to whom it is provided.